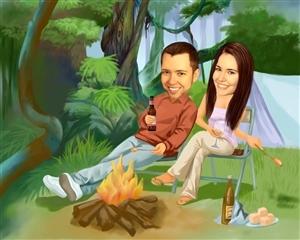 Remind that special someone that you really enjoyed your cozy night in front of the fire with this fun-loving caricature. 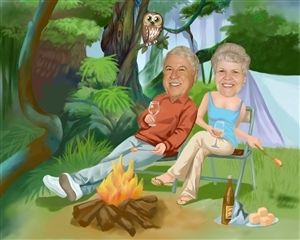 Whether you want to remind them of a great weekend at camp, or maybe suggest that one is needed, this caricature is sure to get your point across. 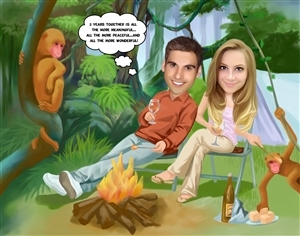 What a great way to "re-kindle" a romance with your loved one, or to show a friend how special your relaxing evenings in front of the fire really are. These make the greatest gifts. Everyone loves them. This is my 3rd art piece and they are never a disappointment as gifts. My boyfriend loved this picture! 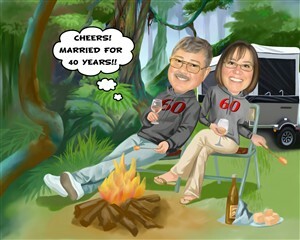 It looked just like us and it was professionally done! Awesome experience!! I wanted something different for my husband who is in Afghanistan for his birthday that is easy to mail. This was perfect! Thank you DaVinci! The entire process was so easy and your customer service was great. 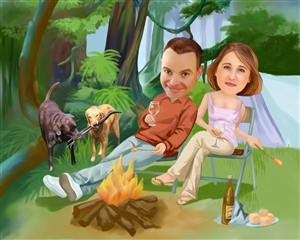 This is a wedding gift for a very funny couple! They are going to love it!!! Very them! They love to go camping!